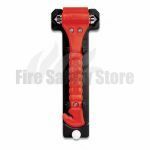 At Fire Safety Store we have a range of hammers and axes that include the Lifeaxe Emergency Hammer is designed to break all types of glass in an emergency situation, those being cars, vans, buses, single and double glazed windows, etc. The Life Hammer is an effective emergency escape tool used mostly in vehicles such as coaches and buses. The Fireman's Axe can be useful in many emergency situations where obstructions are present.